Mike Bradley (email – mbradley [at] fsu [dot] edu) is the Strength and Conditioning Coach for the Florida State University Basketball Team. Bradley helped the Seminoles win the ACC Championship in 2012, play in a school record four consecutive NCAA Tournaments (2009, 2010, 2011 and 2012) and earn a No. 3 seed in the 2017 NCAA Tournament. 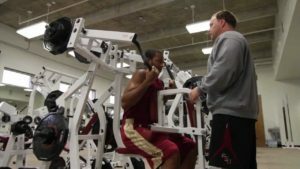 Bradley designed and equipped the state-of-the-art weight room in the Seminoles’ Basketball Training Facility that opened in 2002. The weight room is considered to be one of the best and most complete in all of Division I sports. Prior to joining Florida State, Bradley had a very successful four-year tenure at Stanford, the Cardinal won the Sears’ Directors’ Cup as the nation’s top overall program in Division I athletics four times. Stanford played in the NCAA Tournament each of the four years Bradley worked with the men’s basketball team. In 2002, the Cardinal was 31-3 and led the nation in victories. So much for the value of muscle hypertrophy according to Mr. Bradley! His mention of eccentric emphasized reps caught my attention. Could it be that an eccentric emphasis on repetitions can be cardio-protective…..tendon healing…..trigger-point curative……hypertrophic inducing….flexibility producing….strength producing….myokine delivery jack-of-all trades. Not to mention safe…. Eccentric emphasis is very underestimated indeed and you can actually feel the difference in the muscle and it’s quite profound ! The lowering phase of training is more effective and safer than the lifting phase because in the turn around of the rep is where the joints / connective tissue is the most vulnerable .